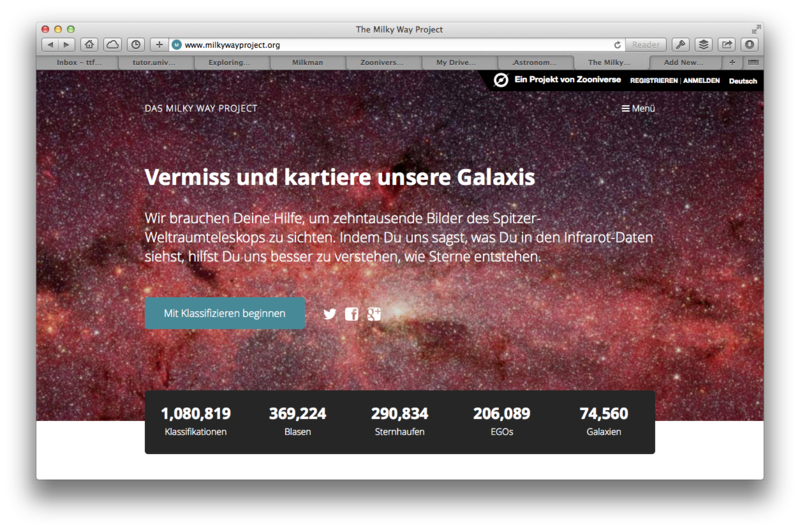 More than 25,000 comments have been made on Milky Way Project Talk since the project began in 2010. That’s a lot of content in itself – beyond the main classification data from the MWP’s main interface. I’ve been using the Python-based Natural Language Toolkit (NLTK) to perform what’s called sentiment analysis on Zooniverse Talk data. 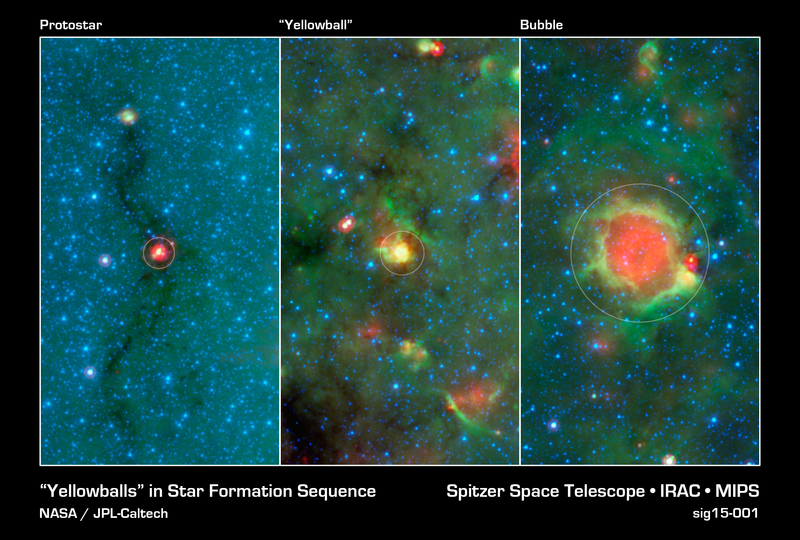 Some of the most stunning results come from the Milky Way Project’s rich dataset. The process is oddly simple – thanks mostly to NLTK’s great documentation. You train an algorithm to recognise positive and negative words and phrases in text – and then go though all the MWP subjects in Talk looking at the things people say about them, and recording whether the comments are positive or negative. If a comment is really positive (e.g. people say ‘stunning’, ‘wonderful’, ‘brilliant’) then it gets a score around 1. If it’s negative (e.g. people say ‘horrible’, ‘stupid’, ‘disgusting’) then it gets a score of 0. Of course most subjects come in somewhere in between. So here are the results: the 20 most-positively commented on images from the MWP (click to embiggen). It’s a lovely set, and you can see why people were so positive about these images. On the flip side, here are the 20 most-negatively commented on images. You see a mix of difficult to classify and blown-out images. I’m now looking at ways to use this sort of sentiment analysis to extract interesting images from Talk and highlight them to moderators and science teams. It’s something I’ve been toying with on-and-off for several projects – not just the MWP. 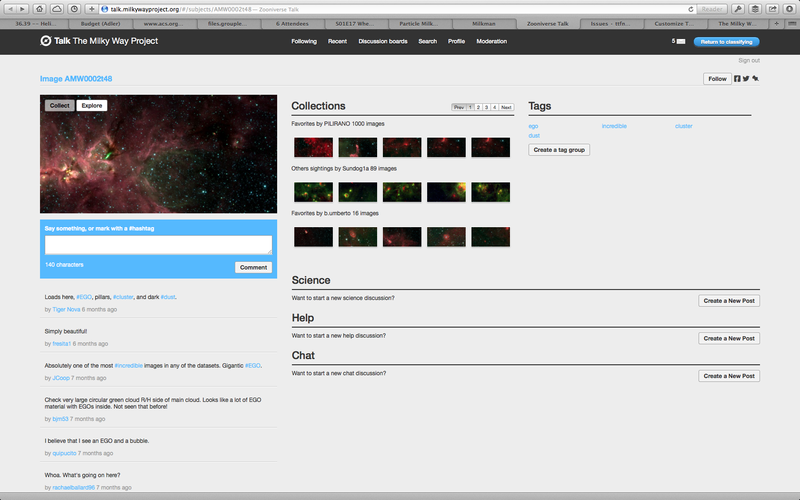 The Zooniverse Advent Calendar seems like a great time to share and see what people think of this idea. You can find my code on GitHub along with other examples. As well as the MWP there are galleries for Galaxy Zoo and Snapshot Serengeti. I’ve been building a new app for the Milky Way Project called Milkman. It goes alongside Talk and allows you to see where everyone’s clicks go, and what the results of crowdsourcing look like. It’s open source, and a good step toward open science. I’d love feedback from citizen scientists and science users alike. Milkman is so called because it delivers data for the Milky Way Project, and maybe eventually some other Zooniverse projects too. 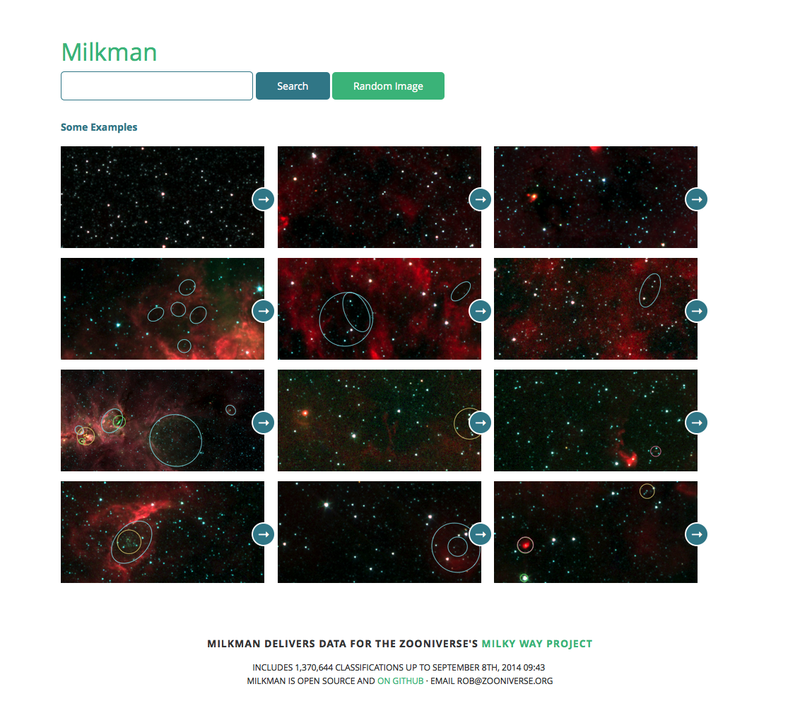 You can access Milkman directly at explore.milkywayproject.org (where you can input a Zooniverse subject ID or search using galactic coordinates), or more usefully, you can get to Milkman via Talk – using the new ‘Explore’ button that now appears for logged-in users. Clicking ‘Explore’ will show you the core view of Milkman: a display of all the clicks from all the volunteers who have seen that image and the current, combined results. 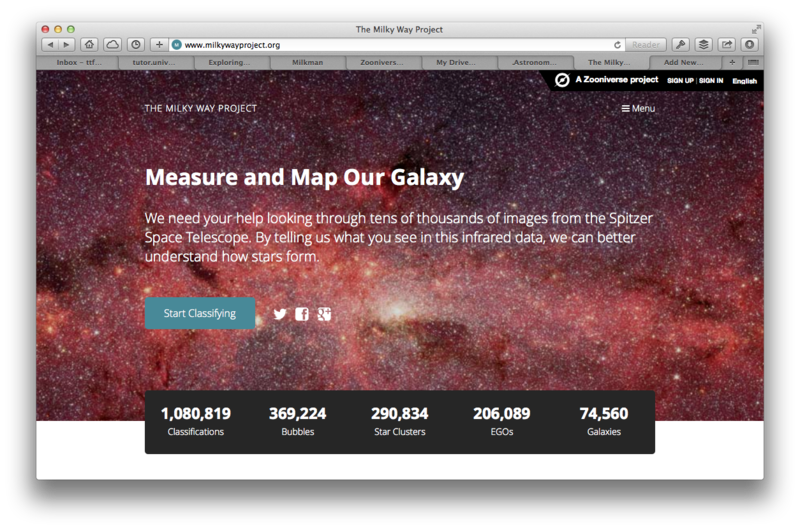 Milkman is a live, near-realtime view of the state of the science output from the current Milky Way Project. It might help people discussing items on Talk to understand what other objects are in the MWP images, and it hopefully shows how volunteers’ clicks are used. Milkman uses a day-old clone of the main Zooniverse database, which means the clicks are at most 24 hours old. The clustering is performed using a technique called DBSCAN, which takes the vast array of clicks on each image and tries to automatically group them up. The resultant, averaged bubbles, EGOs, clusters, and galaxies are often better than any individual drawing, showing the power of crowdsourcing in acton. Milkman is open source on GitHub and I’m happy to accept issues and feedback through the repo’s issues. 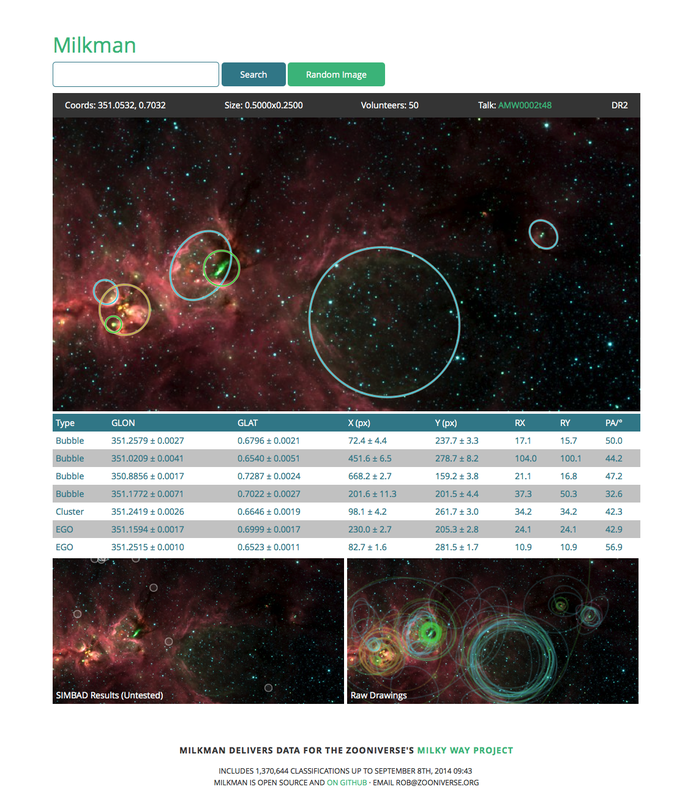 Immediate plans for Milkman include a navigable map on the homepage (to let you explore the whole galaxy), better links to other public astronomical data, and access to the current state of the reduced MWP2 catalogue as a whole. If you have ideas or requests either contact me or create an issue on GitHub. The Milky Way Project has now passed one million classifications since its relaunch a few months ago. The project is currently 75% complete, meaning there are still many, many images left to classify. Which is fine because in fact the project has become truly international lately – with citizen scientists around the world now able to participate in English, Spanish, German, French, Indonesian, Polish and Danish. There are more languages on the way too! If you’re interested in helping to translate the Milky Way Project then get in touch with rob@zooniverse.org – and there are man other translatable project too! After a fantastic (re)launch in December and a busy January, the Milky Way Project was doing well and was about 93% complete… until about 8 hours ago. Last night, the social media powerhouse that is IFLS pointed tens of thousands of people our way and in an hour they finished the project. This is obviously great news for science but some people might be wondering what happens next. The good news is that we have more data! The bad news is that it won’t be ready for another few weeks. In the meantime we are also working on producing some results from all your work, and you can continue to discuss things on Talk. We’ll let everyone know when we have more images to classify but for now: thank you for all your hard work and attention.